You are looking at the set furthest to the right. This 33 inch diameter wheel set is the oldest in the Nevada State Railroad Museum collection, and is of an unusual design. It is built to a design patented by P. Dorsch, and manufactured by G. H. Thacher & Co. of Albany, New York. It was cast in October of 1868 for the Central Pacific Railroad, seven months before the completion of the Transcontinental Railroad at Promontory, Utah. Reading around the rim, the cast on lettering on this wheel says: "PATENTED BY P DORSCH MADE BY G H THACHER & CO ALBANY NY OCT [7 on one side, 17 on the other] 1868". On the web are the initials "C.P.R.R.". It is quite possible that this wheel set was shipped around Cape Horn to reach California. Another possibility is that it was used under one of a group of Central Pacific coaches built in early 1869 by Gilbert & Bush, also of Albany, New York. These cars were delivered to the Central Pacific via the Promontory route after the through line was completed. We do not know how the wheel set came to be on the Virginia & Truckee. It was found by Short Line Enterprises in a truck on one of the V&T flat cars acquired from Hollywood in the 1970s. They recognized its historical value and replaced this wheel set with another so that it could be preserved. 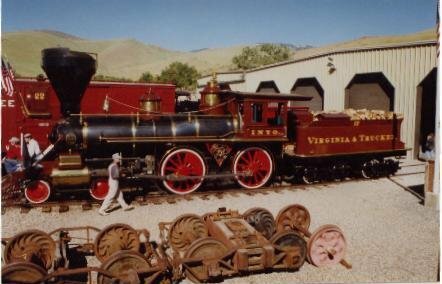 When Short Line Enterprises sold their collection to the Nevada State Railroad Museum in 1988, the wheel set was included in the sale.